So, another beautiful sunny day and I'm stuck at work waiting for customers (think they're all out enjoying the weather) so may as well make the most of my time and show you another one of my completed cards. 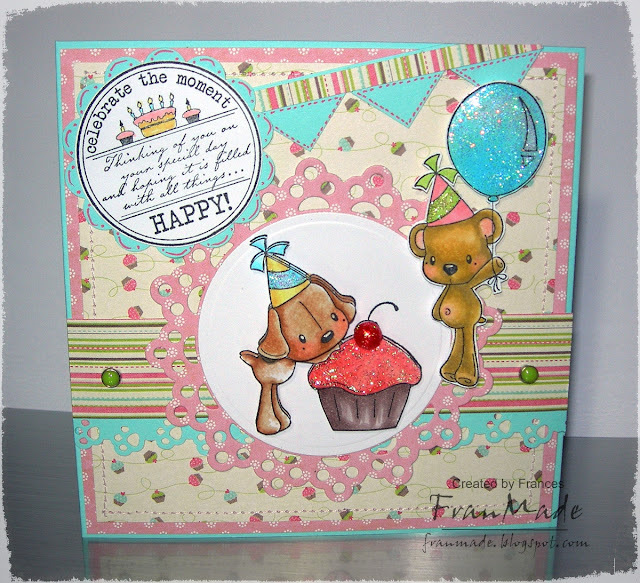 Used a cute CC Designs set I got ages ago that had yet to see ink and teamed it with a Whimsy birthday circle sentiment and a fab MFT Dienamics doily die. As it's a birthday card it qualifies for this week's Stamp with Fun theme so I'm going to join in as it's been so long since I've taken part in any challenges. Added stickles and a big red half pearl for the cherry on the cake and also glossy accented and glamour dusted the balloon. Used EK paw print border punch and couple of brads to finish. Right, that's all from me for today. Enjoy your evening. So here are the 2 60th Birthday cards I was commissioned to make. 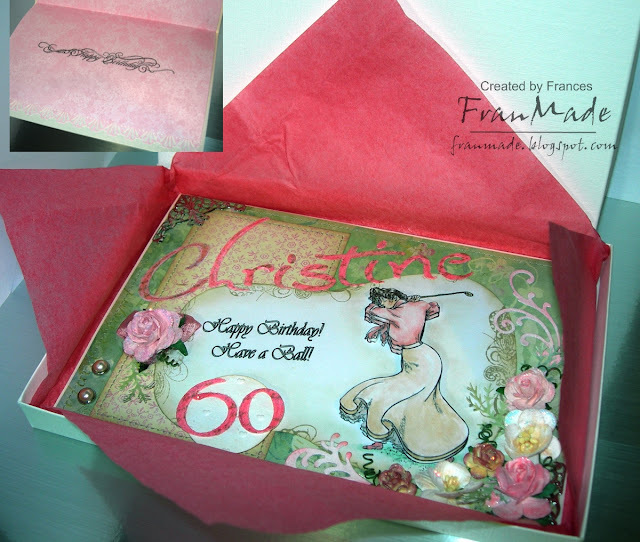 Brief was fairly basic; wanted the name and age on the cards, bigger size (so agreed on A5 size i.e A4 folded in half) and liked all the flowers/decoupage look. The only other thing was that Christine was a golfer. 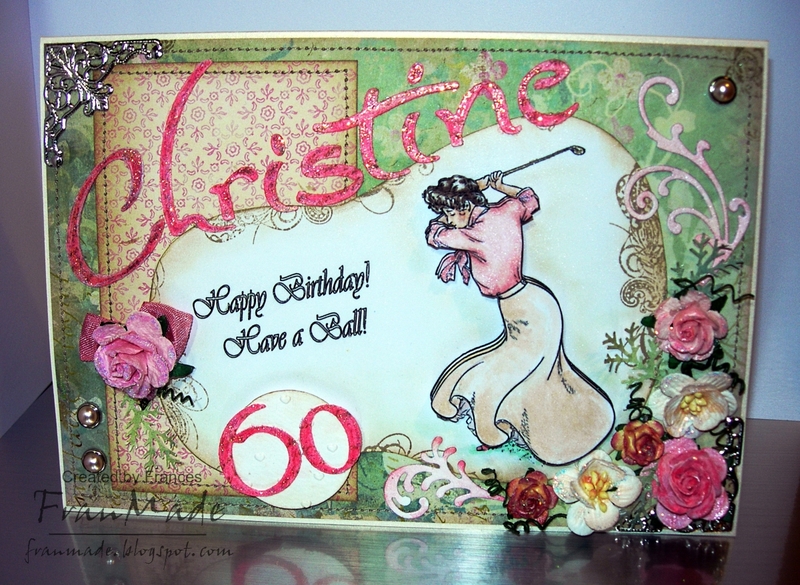 So having no suitable golfing image I googled and managed to find this elegant lady golfer and then the rest of the card just fell together. The shape around her is supposed to be like a bunker/golf course shape and then I thought adding the 60 onto a circle to make it look like a golf ball would be cute. Couldn't resist adding 'have a ball' sentiment! 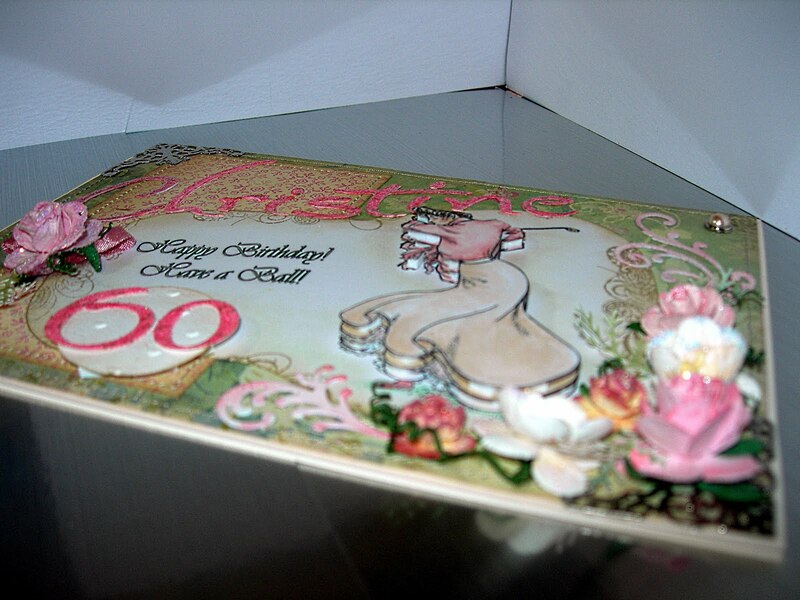 The image has been cut out several times and then layered/decoupaged. Can probably see that better in the shot below. Colours are a lot more subtle IRL but I took these photos at night before I sold them so not the best lighting. She was coloured with copics and then some touches of twinkling H2O to give her blouse & skirt a subtle shimmer. 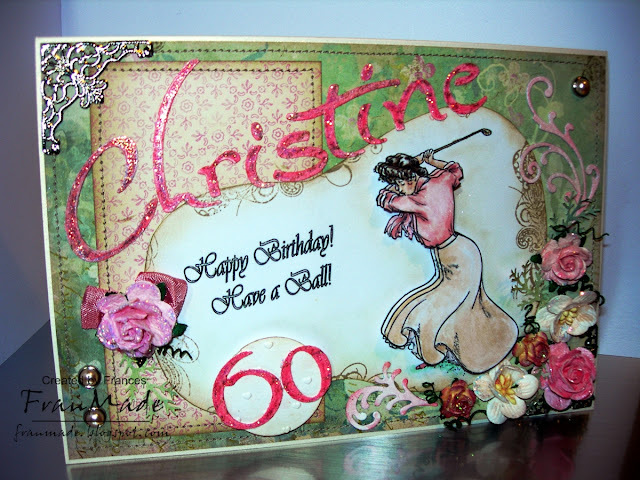 Edges around her were stamped with some flourishes and then sponged with mixture of distress inks and shimmer chalks to tone down the white of the card. Used K& Co patterened papers, machine stitched around the borders. Letters & numbers were cut using Sizzix alphas 'sunset' which I then sponged with pink distress ink and stamped text over them before added stickles over them. Then it was just a case of a lot of arranging/fiddling and glueing down of the letters, flowers and metal brads & metal corner to finish. 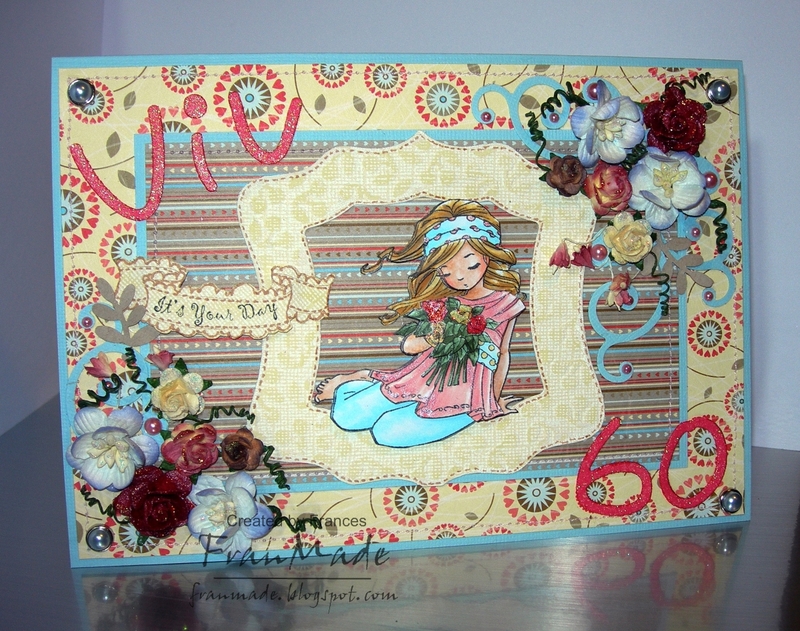 More stickles added to the flowers for more sparkle. Frame image is sitting on is a Nesties die which I cut out with White/yellow Coredinations cardstock and then sanded so that the cute cherry embossing detail shows up but not sure it's that obvious in photo. 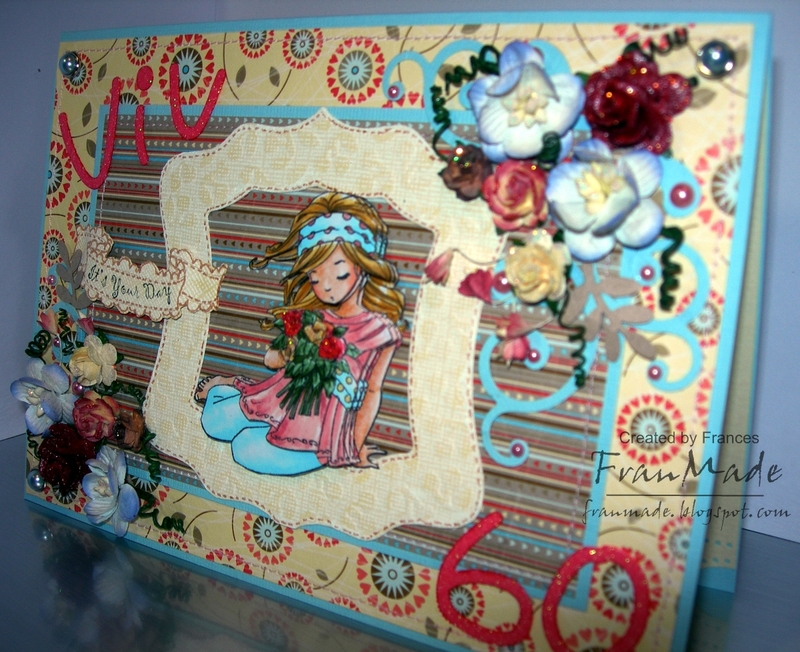 Again image has been cute and decoupaged and coloured with copics/twinkling H20s and stickles glitter on all flowers. 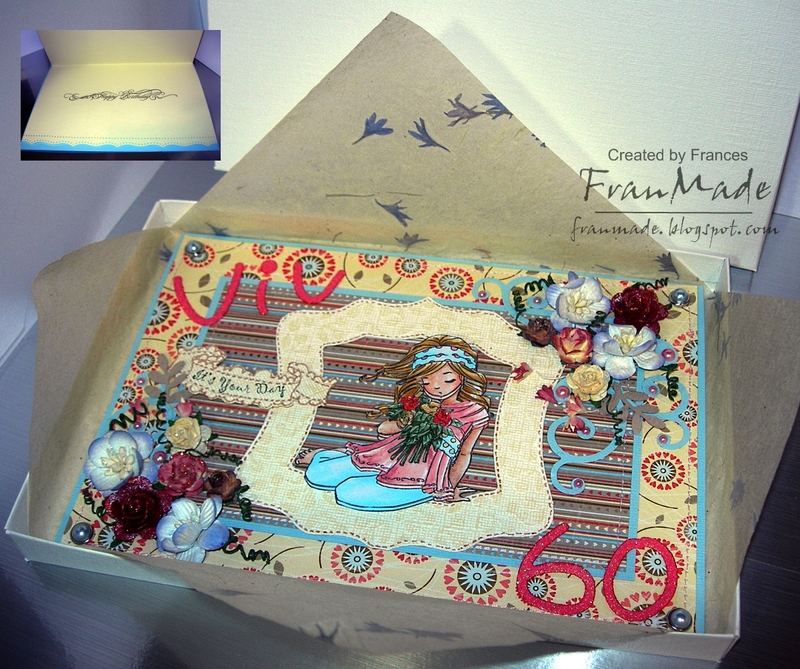 The Lettering & numbers are another sizzix alpha set (think this one is 'tango mango') I cut out of glittered cardstock. then just bit of machine stitching, brads and pearls to finish. 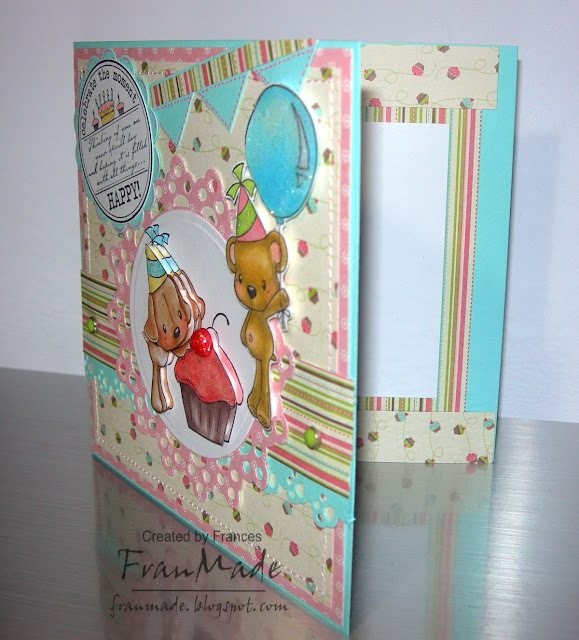 Inside kept simple again with basic insert and sentiment. The buyer seemed happy with them and I hope the recipients like them but I don't think I'm cut out to take request orders as I much prefer just making whatever comes to mind. Too much second guessing myself when I'm trying to work to a brief and wondering if they'll like it! Will see if my other cards fit any challenges floating around at the moment and try to join in with my next couple of posts as it's been a while. Till then, hope you're all enjoying this glorious sunshine. Selling cards and the return of my mojo . . .
Hello there. Sorry for the month long absence again but I have been busy being crafty. I said I would let you know how I got on re. selling my cards. Well, rather then put them on ebay which is a lot of work what with listing them, then posting them and then all the fees/costs involved I thought I'd try just selling them at our shop (we have a take away) even if it isn't really a place you would expect to sell them LOL. So I just decorated a small box and put a selection in and plonked them on the counter and I'm happy to report they are selling . . . whoo hoo :D It's a great feeling. I used a cute CC Designs image I had in my coloured up pile and teamed her with some MME papers, Viva Decor pearl pen, MS border punch and a bit of seam binding to make the bow . Decorated the inside to match.